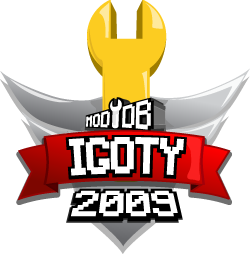 Smokin' Guns 1.0 was released January 1, 2009 & that means it qualifies to run in the 2009 Indie Game if the Year Awards at Moddb. Moddb is a great place to learn about new commercial games, new modifications, and of course independent games like Smokin' Guns. It has served as a way for dev members to upload images, videos, game content, etc for years. SG also gets a lot of new players from the moddb community; so get over there, register if you have to, and vote for Smokin' Guns! Last edited by Pardner on Tue Dec 22, 2009 3:25 am, edited 1 time in total. where do you vote? Takes me to the generic home page. Nevermind- red pointed me out to scroll half way down the page- Didn't read the fine print under the picture! Thanks Red! Made it easier to see now. Thanks Chico. We'll get a bunch of players. Wolfen wrote: We'll get a bunch of players. yeah, and I see our 4343 registered users posting on the forums too. Pardner wrote: yeah, and I see our 4343 registered users posting on the forums too. A good amount of visitors that register on a forum never post, we get more every day that do though. Looks like it's getting to be about that time to give the site a fresh new look and overhaul. This one is showing its age. EDIT: I see Flesh made it though! That pretty cool!